The Waddle Pals set is so much icy fun! I like your fast little pinguin who has so much fun!!! Love the little penguin - he's having a lot of fun. Oooh there's lots I really love about your card ... the layout, fun sentiment and your paper pieced penguin is totally adorable! Awesome idea to create a sledding hill for the little penguin! What a clever and beyond sweet idea! Super cute card!! Love the penguin and sentiment!! Fun!! 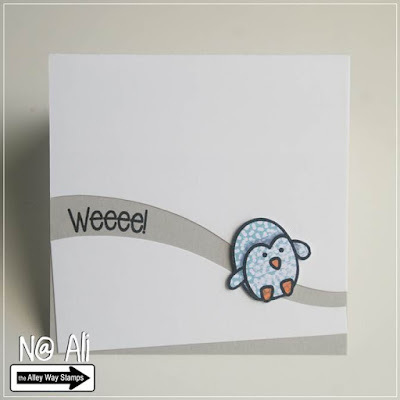 Cute as can be, that sweet paper pieced penguin! This is so cute! The sentiment paired with the penguin sliding down the hill is just perfect. Hey !! Your card is kept as sweet and very simple! I like it very much! !